This is off-topic, but I'm passing it along. Singer/songwriter B.J. 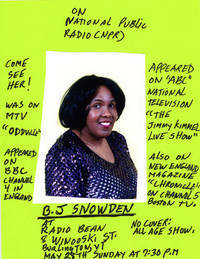 Snowden is playing Sunday at the Radio Bean. My interview with her is in this week's 7D. Listen to her strangely compelling music here. I think my favorite is "New Brunswick." Incidentally, the flyer she sent me (right) says the show's at 7:30, but Lee said 7. I am SO there. Get there early. Burlington's RIDICULOUS fire marshall insists that only like 5 people can be in the Radio Bean these days. I understand saftey is very important, but so is common sense. One is never more than 10 feet from an exit inside the Bean. Oh, I'll be there. I can't get that New Brunswick song out of my head.